The Tang dynasty is often described as China's Golden Age; nearly three centuries of prosperity and territorial expansion based on an efficient central administration and a lively trans-Asiatic trade along the fabled Silk Roads that traversed the Central Asian deserts. Such was the strength and confidence of Tang China that its capital Changan (present day Xian) became a mecca for foreign traders, merchants and itinerants. The Tang court was receptive to foreign styles and fashions in a way that was unique in the history of China. The spirit of the age is clearly echoed in the bright, three-coloured 'sancai', glazed tomb figurines that were much in vogue in fashionable Changan. 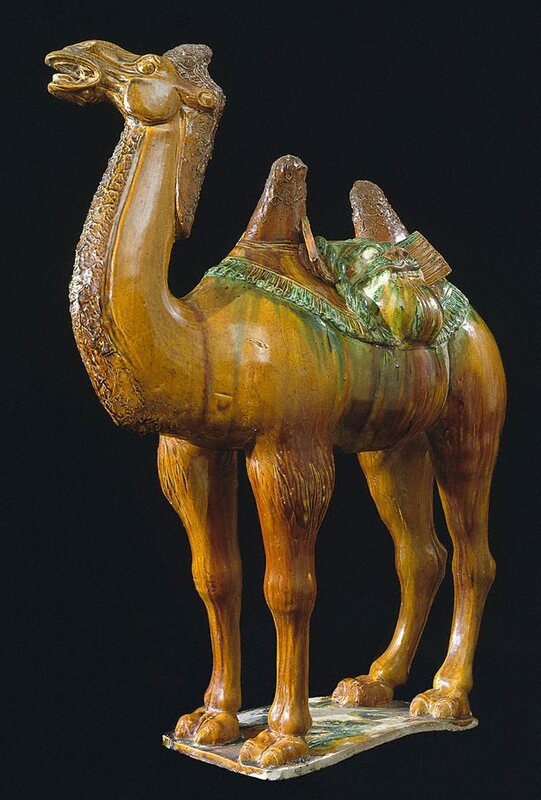 From the sixth century, models of camels were included in the repertoire of tomb figures, reflecting the crucial role they played in the extensive trade across Central Asia. This large and naturalistically modelled figure of a braying Bactrian camel would have been placed in the tomb of a deceased member of a Tang royal or aristocratic family along with numerous other figures, of soldiers, guardians, horses, courtly ladies, entertainers, and others in the service of the deceased. 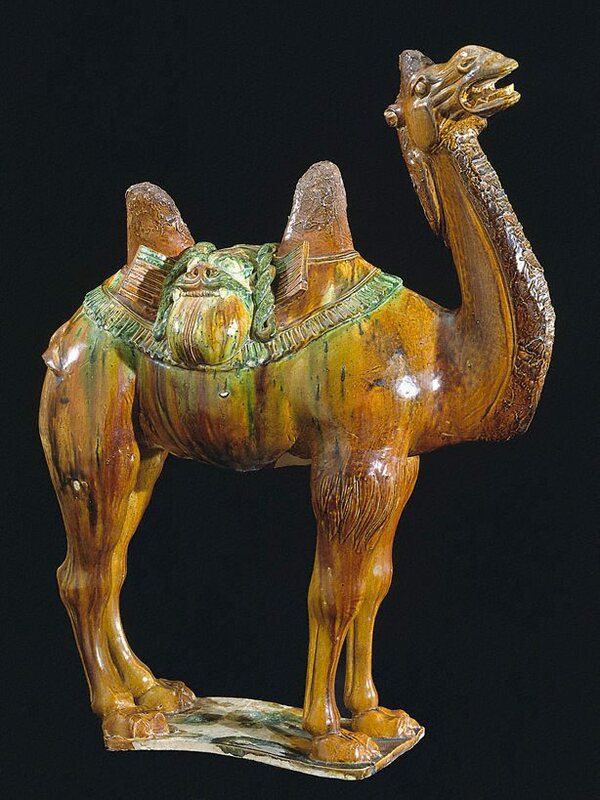 The pack, which hangs down on either side of the camel's body, is shaped to represent an ogre or lion's head. Behind the pack and over a fringed saddle cloth are tent poles for camping at night on the journey across Asia. 'Asian Art', AGNSW Collections, 1994, pg. 192. Jackie Menzies, AGNSW Collections , 'Asian Art - India, South-East Asia, China, Tibet, Korea, Japan', pg. 173-228, Sydney, 1994, 192 (colour illus.). The Asian Collections Art Gallery of New South Wales , 'Tomb Sculpture', Sydney, 2003, 86, 87 (colour illus. ).